Long before I was married and had kiddos, I ran two different after school programs. I based much of my curriculum on children’s literature and built quite the collection of children’s books. I’d also coordinate with the weird and wonderful different “holidays” that I could find. One of my favorites has always been Talk Like a Pirate Day, which falls on September 19th each year. When my nephew was little, I’d send him a new pirate-themed book each year and call do a web chat with him to read it together. 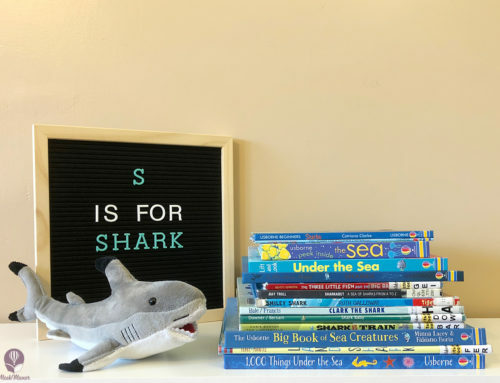 Because, there’s not much more fun than reading aloud books filled with the fantastically fun and silly pirate language. I was so excited when I saw all the different pirate-themed books that Usborne Books & More carries, so we’ve been collecting those too. 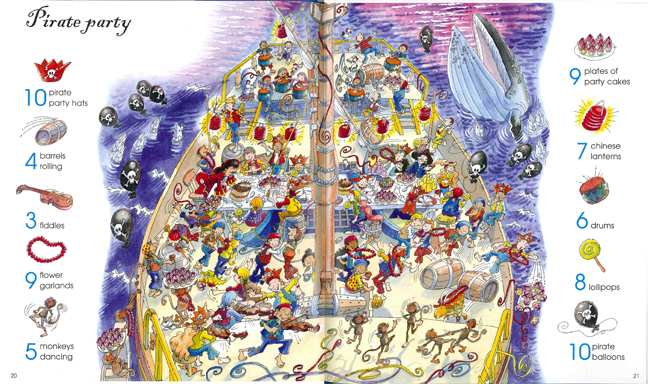 To celebrate Talk Like a Pirate Day, here are our ten favorite pirate children’s books. We can’t get enough of the That’s Not My…books, written and illustrated by Fiona Watt and Rachel Wells from Usborne Publishing. This series just celebrated its 50th release, and they’re only becoming more and more popular. 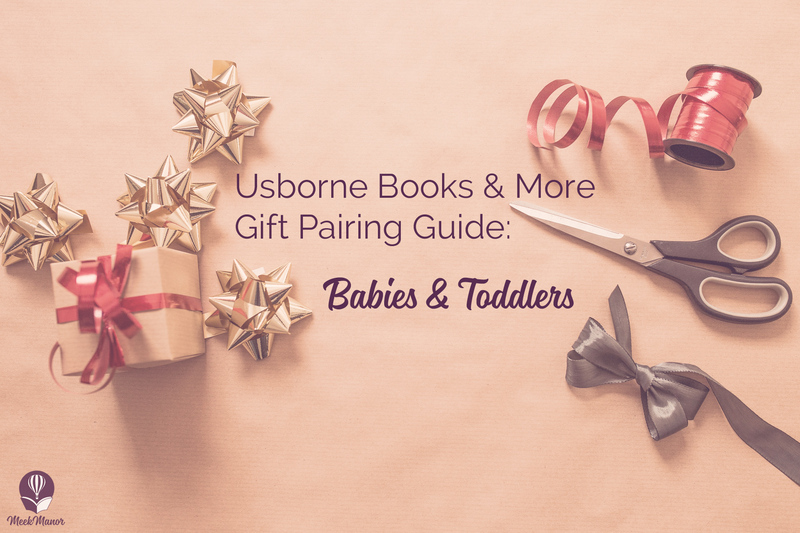 The two and under crowd flocks to these books, with their sturdy board construction and many different textures throughout. Flip through the touchy-feely pages of That’s Not My Pirate until you finally find MY pirate. How I Became a Pirate is the book that started my personal Talk Like a Pirate Day book collection. 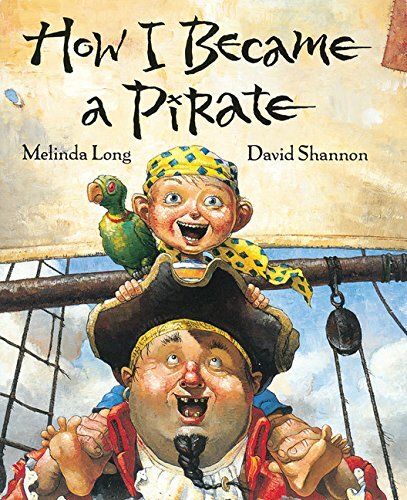 This hilarious book, authored by Melinda Long and illustrated by David Shannon, follows Jeremy Jacob as he joins Braid Beard’s crew of pirates on a search for treasure. He learns words like “matey” and phrases like “shiver me timbers!” Being a pirate isn’t want Jeremy Jacobs thought it would be. It really is “a swashbuckling adventure with fantastically silly, richly textured illustrations that suit the story to a T,” (from Amazon.com’s product description). *Recommended for ages 3-7, but makes a great read-aloud for even younger children who will love hearing the silly words and voices of the colorful characters. Ahoy, mateys! 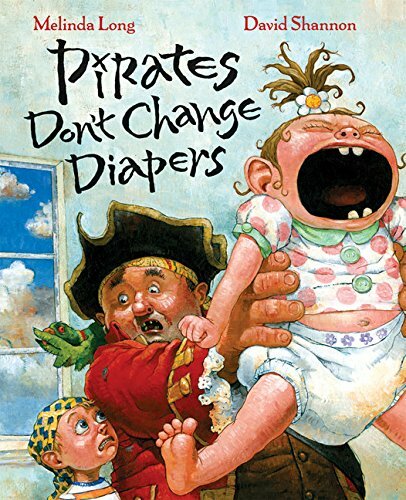 If you loved How I Became a Pirate, then you must also get Pirates Don’t Change Diapers–the follow-up, also authored by Melinda Long and illustrated by David Shannon. Braid Beard’s crew shows up at Jeremy Jacob’s house while he’s watching his baby sister, who was asleep. 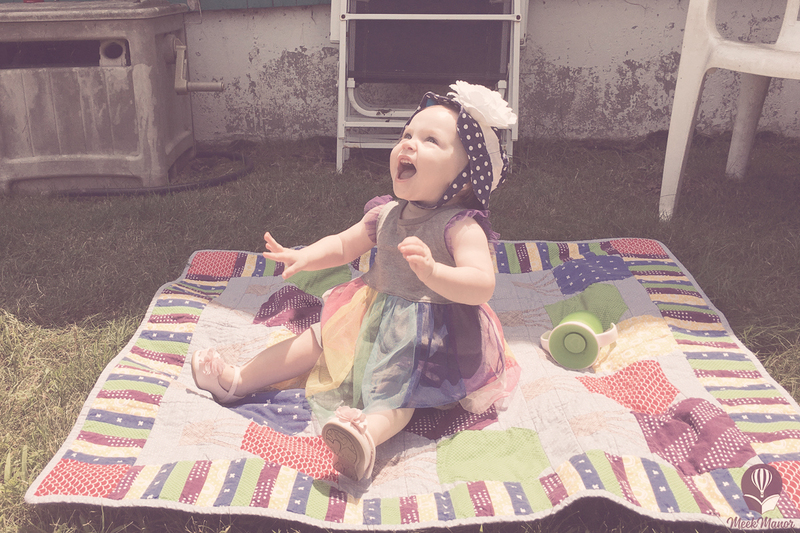 They can’t go find the buried treasure until Bonney Anne “quits her caterwauling.” So, the pirates become babysitters! Hijinks and hilariousness ensue. 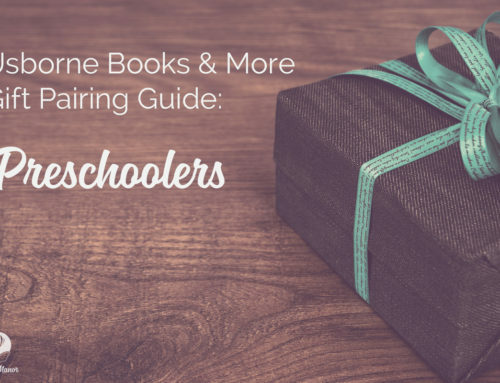 Both How I Became a Pirate and Pirates Don’t Change Diapers make great read-aloud books, as children learn to speak the pirate lingo! 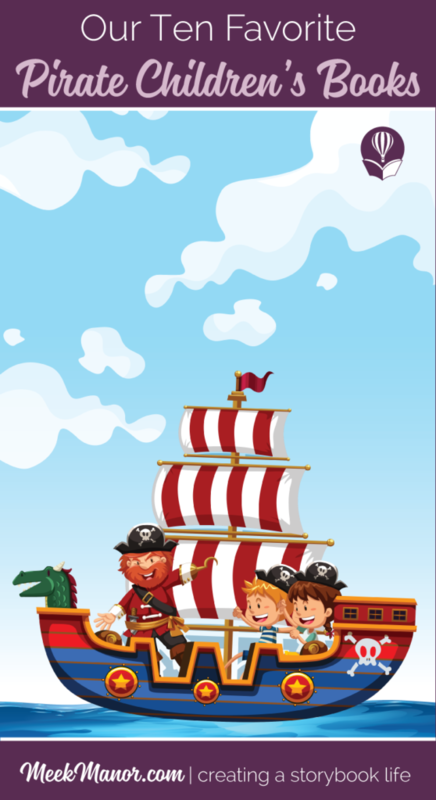 It looks like there’s also now an accompanying Pirates Activity Book. We may need that for next year. Blimey! 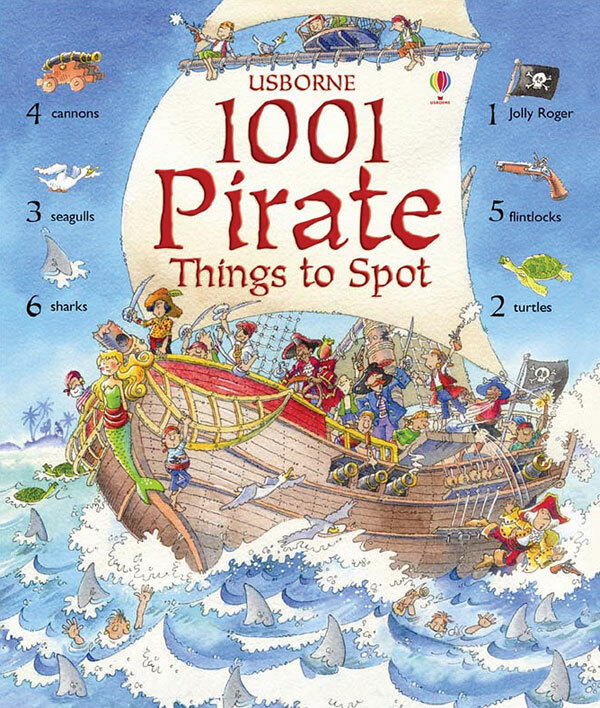 Usborne’s 1001 Pirate Things to Spot will keep your kiddos searching for treasure for hours. Each page spread is filled with intricate scenes with pictures to find and count. Check out this spread! Can you find everything? 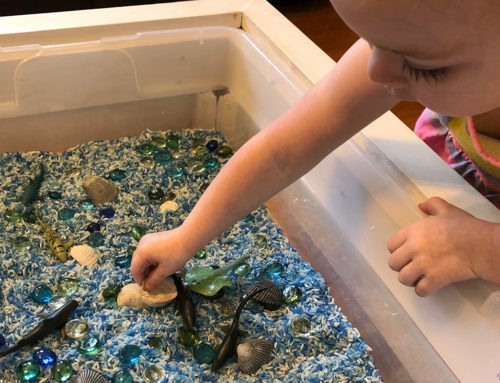 *Recommended for children ages 6 and up, but could definitely fun for an adult to do along with a preschooler/kindergartener. Arrrrr! 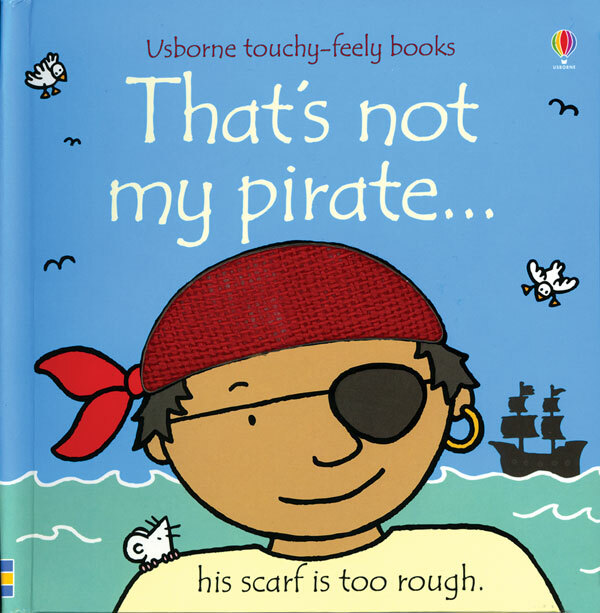 Every marooned pirate needs some Usborne Wipe-Clean books to keep them occupied. 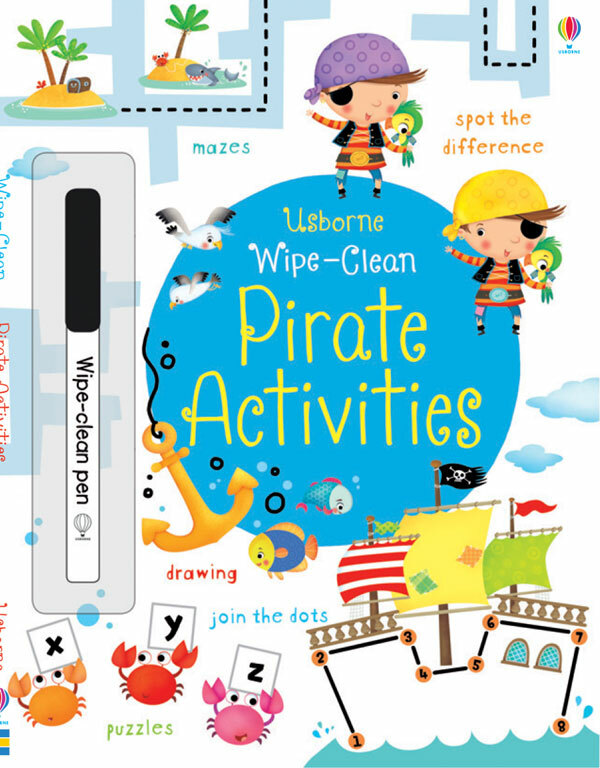 What better than the Wipe-Clean Pirate Activity Book? Filled with activities to encourage pen control, counting, observation skills, and more, your little captain won’t want to leave the house without it. And, since it can be wiped-clean, it can be used again and again. *Recommended for children ages 4+. “What’s this? Mutiny? I’ve been hornswaggled by scallywags and brutes!” Recess has never been such an adventure! 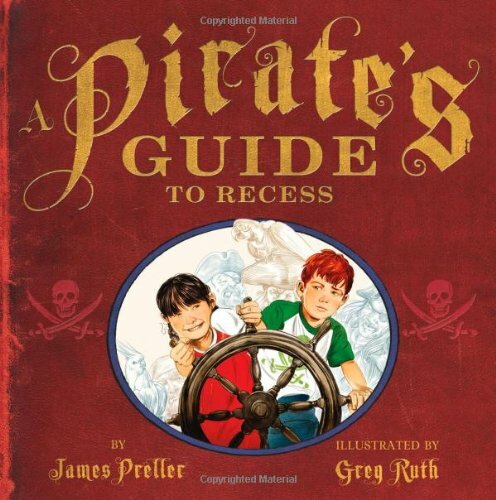 A Pirate’s Guide to Recess, authored by James Preller and illustrated by Greg Ruth, is filled with fabulous pirate language and gorgeous illustrations that show what’s real and what’s imagination. *Recommended for children ages 3 to 6. 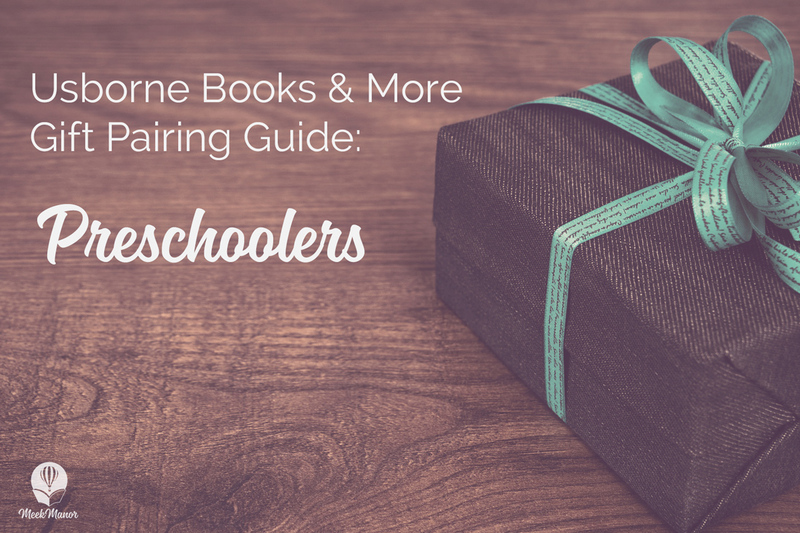 You may also want to check out the follow-up book, A Pirate’s Guide to First Grade. 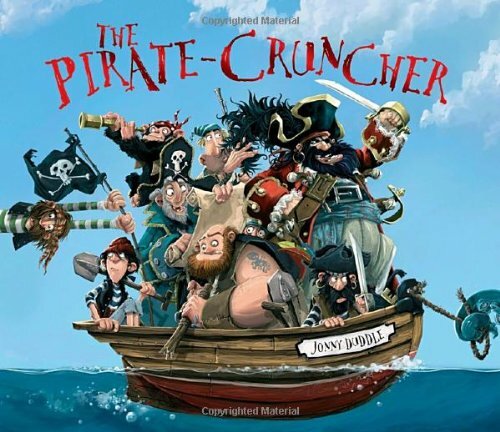 In The Pirate Cruncher by Jonny Duddle, a fiddling pirate sings tales of a treasure–“an island of gold in the Scurvy Sea.” He sang a little chantey outside a tavern and caught the attention of Captain Purplebeard and his crew. Off they went on a great adventure with the fiddler as their guide. 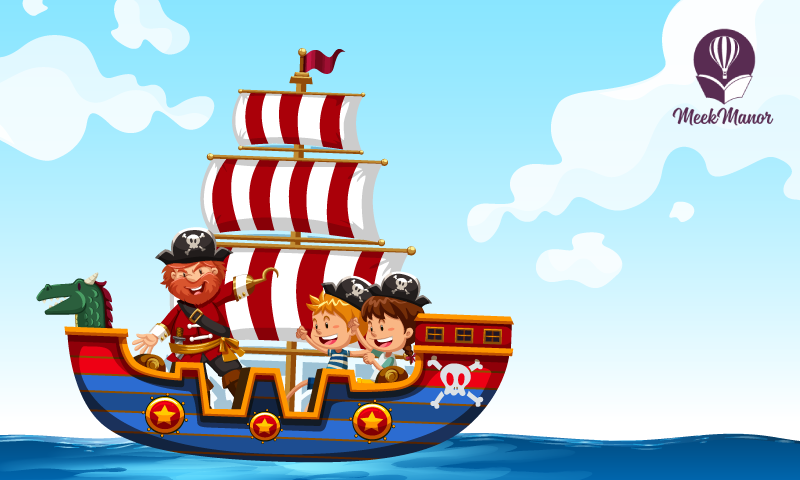 But, could their greed get them into trouble with the Pirate Cruncher? *Recommended for children ages 3 to 7. I know, I know. 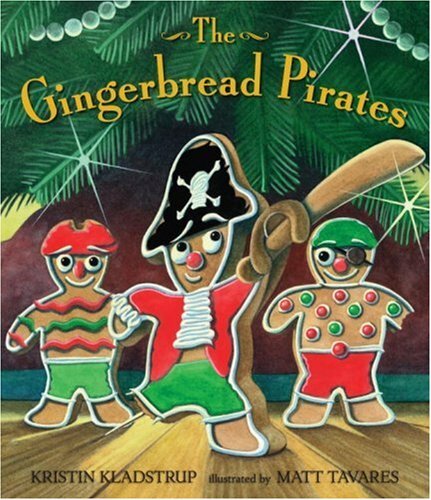 Technically, The Gingerbread Pirates, authored by Kirstin Kladstrup and illustrated by Matt Tavares, is a Christmas book. But, how much fun would it be to pull out for a pirate theme day? Maybe you could bake some gingerbread pirate cookies like Jim and his mom. Let Captian Cookie get into all kinds of trouble! 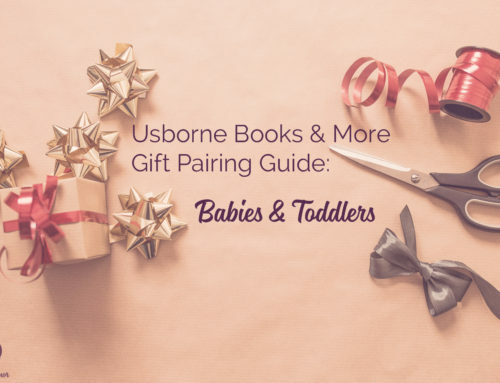 It’s a charming book, with a little different take on the Gingerbread Man, that you may want to pull out more often than Christmas. *Recommended for children ages 4 to 8. 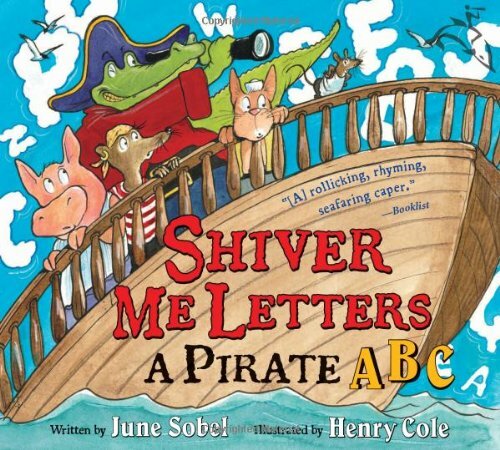 Shiver Me Letters: A Pirate ABC, written by Jane Sobel and illustrated by Henry Cole, follows a captain and his crew as they try to capture every letter in the alphabet. And they make a mess of it along the way. Filled with rhyming and repetitive language, what a fun way to explore the ABCs! *Recommended for children ages 4 to 7, but also a really fun read-aloud with the younger ones. Shiver me timbers! 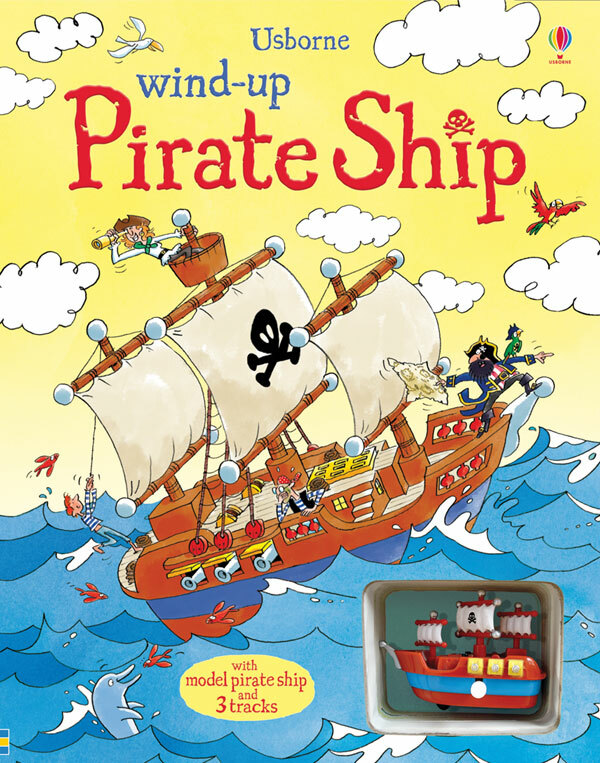 Ye must get yourself the Wind-Up Pirate Ship! It’s a book! With three tracks! And a wind-up pirate ship that follows those tracks! Plus, there’s a story! We may really, really love these wind-up books. *Recommended for children ages 3 and up, due to pieces being a chocking hazard. 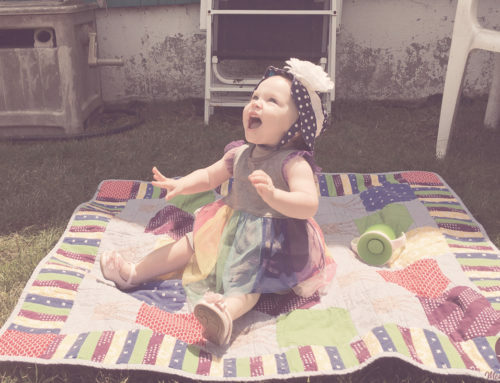 Little hands may need help with the wind-up.